Sporty matte aluminum complete mirrors to replace the stock body colored mirrors fitted to the car from the factory. Mirrors are made from actual aluminum and are fitted with all new internals. 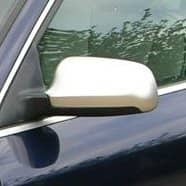 Electronically folding mirrors are available as well. Note: Mirror glasses not included, inquire for options.